In the crystal, a gamma ray undergoes a number of interactions, but for intermediate energies compton scattering dominates. In compton scattering, the incident gamma ray photon is deflected through an angle Θ with respect to its original direction. The photon transfers a portion of its energy to the recoil electron. The energy transferred to the recoil electron can vary from zero to a large fraction (maximum E) of the incident gamma ray energy, because all angles of scattering are possible. The size of the scintillation crystal changes the ratio between photopeak and Compton continuum. For an infinitely large spherical detector centered around a source no photons would be able to escape and only a photopeak would be seen on the spectrum. For very small detectors the chance for a photon to leave after Compton scattering is high and the Compton continuum would be large compared to the photopeak. The Compton edge is a feature of the spectrograph that results from the Compton scattering in the scintillator or detector. This feature is due to photons that undergo Compton scattering with a scattering angle of 180° and then escape the detector. 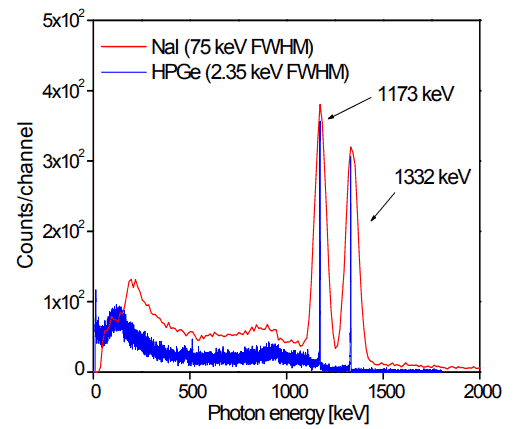 When a gamma ray scatters off the detector and escapes, only a fraction of its initial energy can be deposited in the sensitive layer of the detector. It depends on the scattering angle of the photon, how much energy will be deposited in the detector. This leads to a spectrum of energies. The Compton edge energy corresponds to full backscattered photon. The counts between Compton edge and the photopeaks are caused by multiple Compton scattering events, where scattered gamma photon exits the sensitive material.